Manchester United lack a powerful leader under the bright-minded Ole Gunnar Solskjaer. Despite playing with a few intimidating captains as a player, the Norwegian struggles to find his own inspired leader. Club captain Antonio Valencia’s on his way out after an absentee season. The Ecuadorian might have been quieter on the pitch than he is away from it. Ashley Young has more spit and vinegar but isn't an intimidating presence during matches. A relatively inexperienced squad limits further options. Steely leaders like Roy Keane, Nemanja Matic or Rio Ferdinand no longer occupy the clubhouse. While some lead naturally, the finer points must still be taught even if it's largely through experience. Sir Alex Ferguson had a no-nonsense nature his best captains emulated. Jose Mourinho was more adversarial which discouraged players from speaking out. Solskjaer is known as the baby-faced assassin. Everyone thinks about the baby when considering his personality. Behind the scenes, he must reveal the assassin to mentor a strong leader. The question is who will be the assassin's apprentice? Amid all the questions regarding his future, a statement can be made by handing the captain's armband to the Spaniard along with a deserved contract extension. At the club for eight years now, he's won four United player of the year awards, the only player to do so or win in three consecutive seasons. Signed in 2011, the 28-year-old manned the sticks in Sir Alex Ferguson's final seasons. He is one of the few remaining who remembers what it's like to win a Premier League title. His POTY awards stem from the many times he stole points for the club. Fourteen saves at the Emirates in Arsene Wenger's final Arsenal season stand out. United were played off the park but countered three times to take all three points. If that doesn’t inspire a team, nothing will. De Gea just needs to assert his senior status. He possesses the traits for being an inspired captain akin to Peter Schmeichel. He can lead by example but also has a fire and intensity that deserve to be put on display more often. The stand-in captain’s experience makes him a prime option for the armband. However, he’s rarely convincing in his right-back role. 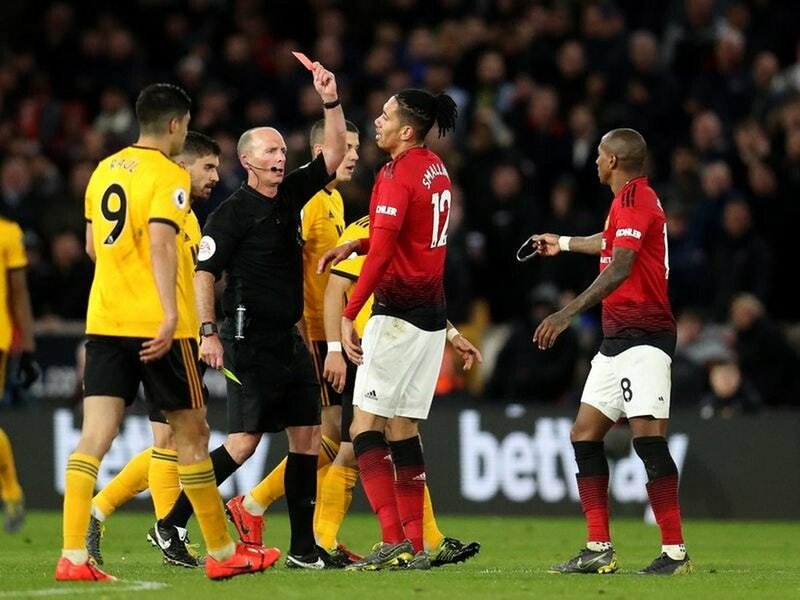 Young's foolish lunge that caught Diogo Jota on the shin highlighted his inability to match the game's pace and allowed Wolves to complete a 2-1 comeback after Mike Dean handed out his 100th red card as a referee. That's a pub bet to which no player wants to be the answer. Going forward, he’s too inconsistent, often ruining moves with botched crosses which demotivate his attackers. That being said, Young’s vocal approach, ability to interact with referees and influence younger players are qualities a captain needs. Unfortunately, time isn't on his side. To improve his defensive positioning, he must support the attack less than he already does. To support the attack, he must leave an inadequate defence exposed. Nor can an effective captain lead from the bench. The French maestro is Solskjaer’s golden boy, scoring and creating goals for fun when slotted into a more advanced role. When asked to occupy a more deep-lying position his game suffers. He doesn't appear as committed to defending as he is to playing on the front foot. A captain cannot appear to lack commitment in any capacity. Jose Mourinho questioned Pogba's leadership when he posted on social media during the EFL Cup loss to Derby County, taking vice-captain's duties away from him. Solskjaer reversed the decision but Pogba tends to have his worst performances when wearing the armband. His game becomes ponderous. Perhaps he feels he must do more rather than continue to play quick one-twos before markers can close him down. Pogba’s leadership qualities were on display for France during the World Cup. Dressing room videos revealed him giving inspirational talks. If he takes the same responsibility at Old Trafford, it hasn't been reported. All we see is his inconsistent performance on the pitch. If Solskjaer can teach him how to carry the added responsibility, the Frenchman would be a beast in a red shirt. At this point, that's a big if. Not the most convenient option considering his inexperience, Lindelof's leadership qualities are emerging. In his second season, the Swede’s living up to the hype. He puts in strong shifts, showing both composure and passion. Fists in the air when Kieran Trippier sailed a free kick high and wide in the match against Tottenham revealed the inner fire. Gutting it out with a thigh injury when Mourinho used all three substitutes against Crystal Palace in November proved his commitment. The 24-year-old outraced Jordan Ayew to a dangerous long pass and fought off double-teams to maintain possession, drawing a rare bit of praise from his former manager. Lindelof’s distribution, man-marking ability and tackling awareness all improved by strides. No longer does he look a shaky amateur. He needs to be more vocal on the pitch and assertive with his skills to motivate those around him. At the moment he defers to senior partners Chris Smalling and Phil Jones. Next season, he might be the senior partner. If he takes on the responsibility, he can be United's next Rio Ferdinand.